Gus was born and raised in Beverly, MA. He attended Gettysburg College and Salem State College as a business administration major. He worked three years in Palm Beach, FL as a firefighter/paramedic, giving up the career to assist his wife in opening Falmouth Physical Therapy in January of 1992. Gus is very active in coaching basketball in Falmouth and southeastern Massachusetts. He is a varsity girls basketball coach at Falmouth Academy and handles the strength and conditioning for Pope John Paul 2 High School Baseball. 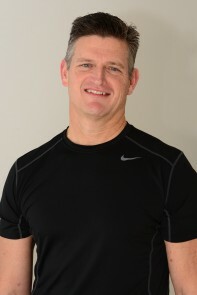 As a personal trainer Gus works with local athletes individually and group training. He currently works with the Cape Cod Swim Club, Cape Cod Thunder Baseball Club & also the Cape Cod Clippers Baseball Club. Gus also offers TRX Training at our Physical Therapy Facility. After years of competitive basketball and some marathon running, Gus enjoys going to the gym, hiking, walking in Beebe Woods his two dogs. He also enjoys watching his three children play sports.